HE Dr. Tawfiq bin Fawzan Al Rabiah is Saudi minister of commerce and industry. Al Rabiah began to work as a teaching fellow at the University of Pittsburgh. Then he worked as a faculty member at King Saud University. He served as the director general of the Information and Communications Technology sector at the Saudi Arabian General Investment Authority (SAGIA). In April 2007, he was appointed the Director General of the Saudi Industrial Property Authority (MODON). He also served as an acting deputy commerce and industry minister and a supervisor for the National Industrial Strategy Institution from April 2010 to January 2012. 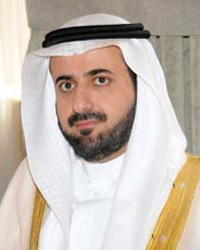 On 13 December 2011, he was appointed the minister of commerce and industry to the saudi cabinet. Al Rabiah is also the chairman of the Board of the Directors of Saudi Arabian Standards Organization (SASO), of Commission for Development of Industrial Cities and Technical Zones and of MODON. Al Rabiah was successful in implementing the concept of “industrial estates and technology zones”, since he is actively involved in establishing such zones in different Saudi cities.